The 17-million-acre Tongass National Forest in Southeast Alaska is one the world’s largest wild salmon producing regions, annually contributing about 50 million fish to Alaska’s multi-billion-dollar salmon industry and providing sportfishing opportunities for over 100,000 anglers every year, amounting to nearly $1 billion added to the local economy and an estimated 10 percent of the region’s jobs. 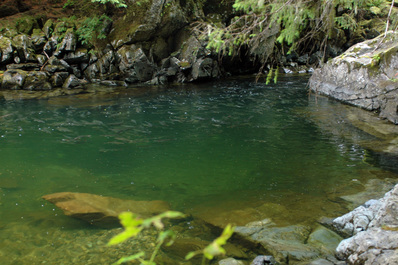 Despite its abundance, the Tongass and its salmon face serious threats. Timber and mining development, road building, climate change, more than 40 proposed and existing energy projects and several initiatives to privatize large swaths of the Tongass are currently in the works. These development activities have the potential to negatively impact the spawning and rearing habitat of Tongass salmon and trout. Limiting further habitat destruction is crucial to the continuation of the Southeast Alaska salmon success story. Currently, only about 35% of the salmon and trout spawning and rearing habitat in the Tongass is conserved at the watershed scale. The rest remains open to development activities that could harm fish. The Tongass 77 proposal would conserve an additional 23% of the salmon and trout spawning and rearing habitat available in the Tongass on only 12% more of the total Tongass land base.